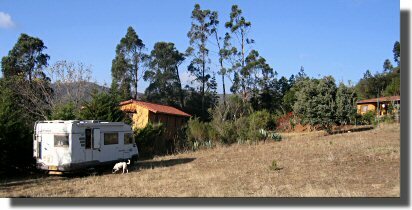 We are now camped at the Dutch run Finca La Vispera just outside Samaipata, Bolivia. We had intended to stay at the much recommended (and advertised) Landhaus Helga, but when we arrived they were full and the access was too small for us anyway. La Vispera has a large camping/parking area, a cafe (not open after 17:00), laundry, water, hook-up (220 volts) etc. Costs are $10USA per vehicle per day (S 18.188157 W 63.879533). Recommended. There are two reasons for being in Samaipata, one is to see El Fuerte de Samaipata (a very big rock) and the other is to drive south from Samaipata to Vallegrande (to see a hospital laundry famous for a dead body). To get from La Paz to Samaipata we drove thru Cochabamba. 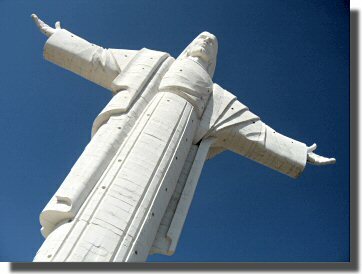 The guide books say that Cochabamba's only claim to fame is a 2000 tonne statue of Jesus overlooking the town ( Cristo de la Concordia ) The guide books also say the statue is lacking in artistic merit. Very true, but it is very big, claiming to be the biggest in the world. I would like to add a second claim to fame: The Club Social Cochabamba! On the corner of the Plaza 14 de Septiembre is the Cafe Paris, ignore it! Go down the street to the right, where, just behind the cafe, you will see the discreet entrance to the Club Social Cochabamba. We were invited in and offered the three course set meal for about $1.50USA! We were the only dinners not dressed in our Sunday best. The soup was served by a uniformed waiter from a silver tureen. The faded elegance of the room, and the other diners' disdain, was reminiscent of the scene in the film Evita where the Argentinian aristocracy show their distaste for Evita. An experience not to missed if you are in Cochabamba, hungry and well-dressed. Highly recommended. We spent the night in Cochabamba parked by Plazuela Corazonistas on Tarapaca Street at S 17.390663 W 66.163527. Apart from the line dancing in the square, we had a very quite night. The other notable town we visited en-route to Samaipata was Tarata (about 30km South East of Cochabamba). 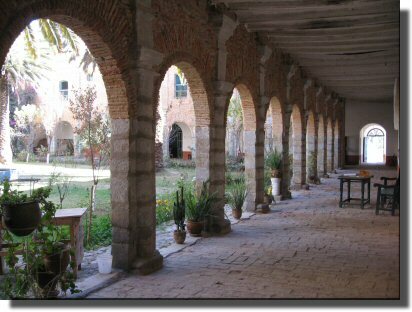 The old convent is well worth a visit before they convert it into a hotel, or it falls down.